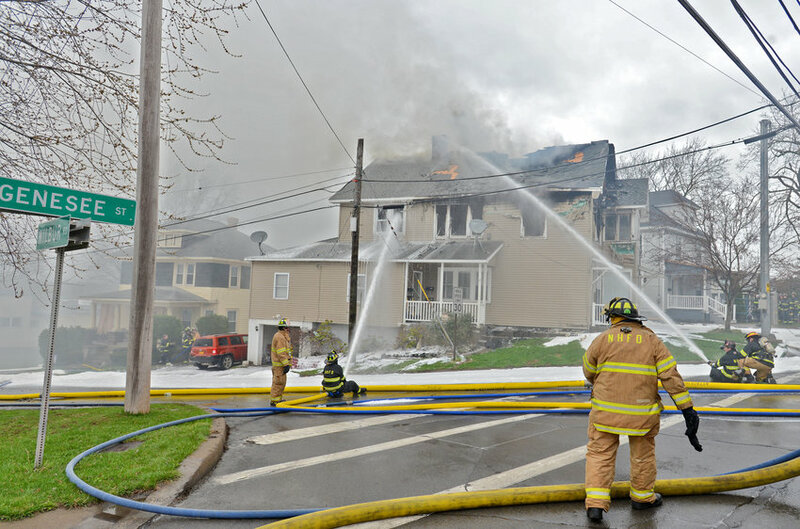 WESTMORELAND — One man is displaced after his house caught fire on Bartlett Road Friday afternoon. Fire Chief Jeff Grube said no one was home when the fire started “around the fire place area.” No one was injured. Grube said a passerby spotted the smoke and called 9-1-1 at 3:09 p.m., and the homeowner arrived home from running errands shortly thereafter. “He came home and found his place on fire,” Grube stated. The property at 5317 Bartlett Road is located just west of the Town of Westmoreland, between Lowell Road and the Thruway. Volunteers from six departments responded to the scene and immediately launched an interior attack, the chief stated. There was heavy fire at the rear of the building. “The firefighters had a great knock down,” Grube stated. The flames were under control in about 40 minutes. Crews remained on the scene for several more hours dousing hot spots and cleaning up. Grube said the residence was “heavily damaged” by fire, smoke and water, but the home might not be a total loss. Grube said there were no injuries. The one resident is staying with other family. The chief added that the cold and snow did not hinder the firefighting efforts. The Westmoreland, Vernon Center, Verona, Vernon, Stanwix Heights and Clark Mills fire departments responded, with Oriskany on standby.